Upon completion of Levels I through IV, Mat Certification, the anatomy component of the PCI Teacher Training Program, and satisfaction of apprenticeship hours, the student is eligible for the final comprehensive written and practical exams. It is recommended that the student maintain a personal Pilates practice and student teaching practice for 3 to 6 months after the Level IV workshop before scheduling these tests. Both exams are evaluated on a pass/fail basis. The final written exam is a take home test. The student is expected to know all subject matter presented in the workshops. This test will be mailed via email or USPS after payment is received. The student will have two weeks to complete the test and return it to the Moving Breath Pilates Studio. The written test should be completed prior to the teaching test. Student Performance Test. Students are asked to perform all PCI Mat exercises and all Level IV reformer workout using the PCI order of exercises. The student may be asked to demonstrate safe equipment setup, exercise execution, or correct spotting technique for specific exercises. The Mat Certification performance is preformed 40 days after completion of the Mat Training weekends. The Reformer performance exam is given during the Level IV weekend workshop. Students will teach a 55 minute Pilates Method lesson during the Mat Certification testout, and a 55 minute equipment class during the Comprehensive Certification testout to a client provided by the examiner. The lesson will be based on the particular needs of the client. Also, the student submits a written defense of this lesson, an evaluation of the client, and a 3-month lesson plan. Return to Life (Joseph Pilates), and Your Health (Joseph Pilates) as well as Anatomy of Movement (Blandine Clais-Germaine), and Musculo skeletal Anatomy Coloring Book (Joseph E. Muscolino). Anatomy of Movement Exercises (Blandine Calias-Germaine) and Taking Root to Fly (Irene Dowd). 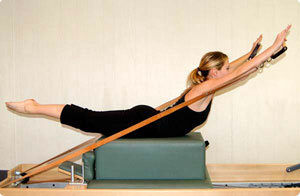 Pilates Core Integration Chair DVD, Trapeze Table DVD, Spine Corrector DVD, Ladder Barrel DVD - All by Virginia Nicholas. Core Dynamics DVDs: Eve Gentry 1991 Workshop, Reform It, and the new Eve Gentry Documentary.